Team Savasana, US Winter Series champions powered by North Sails. North Sails products are designed to be a tool for our clients to help them excel on the race course. North Sails has developed fast, user-friendly sails that give teams like Brian Keane’s a competitive advantage. 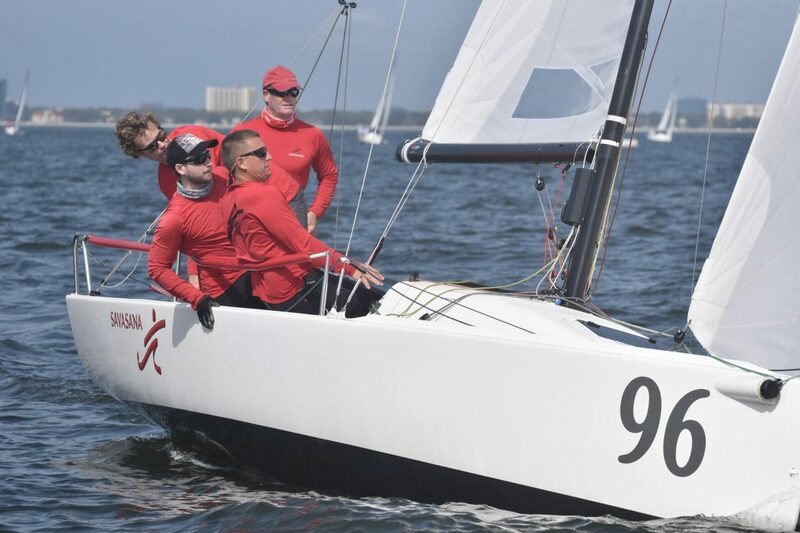 We caught with Brian after his race series win in Davis Island, FL where he sailed his way to success through a high level of competition in the US J/70 class. Each regatta result finish his team had totaled 7 points in the three-event series, and given one throw out he was left with only 4 points. Here’s what Brian had to say about his team, how they prepared for the winter series, and how they maintained consistency through three regattas, giving his team the overall series win. NS: The entire series had all types of conditions. It was windy at the first event, shifty in the second, light air in the third. How did your team adjust to keep such great consistent results? NS: What are some things of most importance that you focus on going into each event given that you might have maybe a different crew every time? „Because we had a different trimmer in each of the three events, we made sure that we got there early >to practice. We spent about a day and a half practicing. And part of that practice is working on boat handling and our settings for different conditions, so everybody knows who’s doing what. The other part of that practice is then to make sure, from a speed standpoint, we are where we need to be. North-powered boats finished 1,3,4*,5*,6,7 at the 2017-18 US Winter Series. NS: Out of all three events, was there a race highlight, or a moment that stuck out that you remember? NS: What advice would you give a new J/70 team? “We sometimes call it „sail by the numbers.“ We have a lot of data and we know exactly how we wanna set up for every condition. We’re not wasting time wondering what the right setup for the rig or for sail trim is as the conditions change. As the conditions change, we can look at our grid and we know what to do. NS: What were the biggest contributions to your team’s success this weekend? 1, 3, 4*, 5*, 6, 7 / Congratulations Brian Keane and team Savasana! [From Left] Max Nickbarg, Thomas Barrows, Brian Keane and Ron Weed. The North Sails products are designed to be a useful tool for our clients to help them excel on the race course. Given the right combination of sail power and condition-driven designs, paired with a competitive racer that is driven to win, means things are in a balanced equilibrium. Brian Keane has a sailing program that fits right into this concept of balance, focused on one main goal: to win races and win regattas. We caught with Brian after his race series win in Davis Island, FL where he sailed his way to success through a high level of competition in the US J/70 class. Each regatta result finish his team had totaled 7 points in the three-event series, and given one throw out he was left with only 4 points. Here’s what Brian had to say about his team, how they prepared for the winter series, and how they maintained consistency through three regattas , giving his team the overall series win. Our products are designed to be a useful tool for our clients to help them excel on the race course. Given the right combination of sail power and condition-driven designs, paired with a competitive racer that is driven to win, means things are in a balanced equilibrium. Brian Keane has a sailing program that fits right into this concept of balance, focused on one main goal: to win races and win regattas. Because we had a different trimmer in each of the three events, we made sure that we got there early to practice. We spent about a day and a half practicing. And part of that practice is working on boat handling and our settings for different conditions, so everybody knows who’s doing what. The other part of that practice is then to make sure, from a speed standpoint, we are where we need to be.